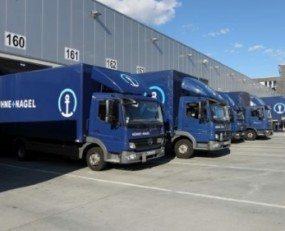 Kuehne + Nagel is investing in its European Pharma fleet to strengthen the KN PharmaChain overland service in the region ahead of peak season… Kuehne + Nagel has deployed 35 new pharma trailers and before the end of the year another 45 will be added to the existing fleet, with a further planned expansion of 200 trailers in the coming years. By enlarging its own dedicated trailer fleet of standardised Schmitz Cargobull Chassis with Thermoking cooling units (mono, bi-temp and double-deck equipment), Kuehne + Nagel aims to facilitate seamless services for active temperature-controlled Full Truckload and Less than Truckload shipments across Europe. The new pharma trailers are fully GxP compliant and offer up-to-date technology for temperature-controlled transports, including dual temperature, double-deck equipment, Transport Asset Protection Association compliant integrated security locks to be opened remotely with a unique code, integrated control panel, printer for temperature report and GPS control for positioning, temperature, door sensors, coupling and technical status.